North Of 4th Ave Big Character Revenue Bldg on 50’x120’ South RT-8 lot between Larch & Trafalgar Streets in prime Kitsilano. 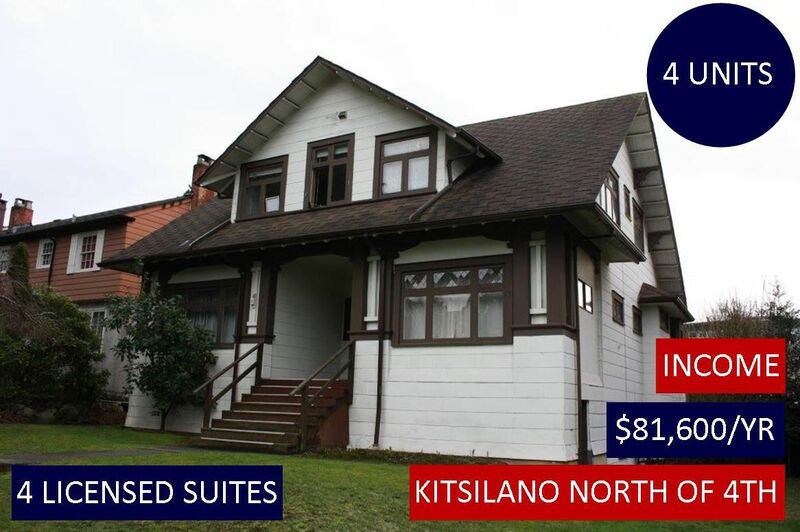 The 3977 SF building is in good condition & contains 4 licensed suites: 1.Top 1183 SF 3 bdrm $2,500/mo 2. Main: 400 (approx) SF Studio $1,000/mo 3. Main: 800 (approx) SF 1 bdrm & den $1,700/mo: 4.Ground: 850 (approx) SF 2 bdrm $1,600/mo. Total $6,800/mo, $81,600/yr. Very charming house w/high ceilings, character mouldings, h/w floors, spacious, bright suites, large tenant storage, single garage & 4 open parking. Mechanicals are good. 6000 SF lot good for RT-8 strata redevelopment. Great property for Investors, Owner-Occupiers & Developers. Call LS for info pkg, floorplan. Showings 48 hrs notice, by Appt. Showing Mon Feb 19th @ 2:00pm gone by 2:45pm by Appointment.